Detectives investigating a serious assault on a man in Newtownabbey in August of last year have made a fresh appeal for witnesses. Anthony McMahon (59) was found unconscious and sustained severe head and facial injuries in a carpark on Longwood Road at 10:40pm on Tuesday, August 15. A passing PSNI TSG patrol administered emergency first aid to the victim, who had been savagely beaten, prior to the arrival of paramedics. Detective Inspector Chris Millar said: “The injuries sustained by Mr McMahon were such that he was left unrecognisable to even his closest family members and he had to undergo reconstructive surgery. “His injuries were much more than ‘serious’, they have been life-changing as displayed in a photo we are releasing. “Thankfully, he survived and has come through this but the nature of this attack was both shocking and brutal. Anthony McMahon pictured on the day he was attacked. “I cannot stress enough just how violent and wicked this assault was and I am again asking the public to help identify the ruthless and cowardly perpetrator who carried out this vile attack. “We would like to hear from anyone who was in the Longwood Road area on Tuesday, August 15. Did you see Anthony McMahon in the area on that night? Detective Inspector Millar added: “We are also issuing new CCTV footage along with an image of an individual we would like to speak with in relation to this incident. 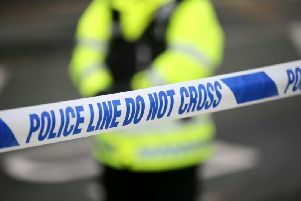 The man is described as being in his 40s, of heavy build and wearing a white shirt along with a dark suit-jacket and trousers. Anthony McMahon sustained life-changing injuries following the attack. “If this is you, or you know this individual please get in touch with the PSNI. “Please call 101, quoting reference number 1360 15/08/17 if you have any information, no matter how small or seemingly insignificant. Police would like to speak with this man in relation to the incident.